A live production of the 1975 Broadway musical, "The Wiz", which put a modern spin on the classic "Wizard of Oz" tale with a cast of only African-American actors. I only got to catch a little bit of it but those costumes were really awesome. It was also refreshing that they didn't feel the need to "urban-ize" it as the 1978 film version did by placing the story in New York City. As a side note, there apparently was a bit of a hubbub on Twitter from white people complaining that the all-black cast for this adaptation of The Wizard of Oz was racist. This is a form of stupidity that doesn't really bear discussion, but it is hilarious. Clever viewers will, of course, have already noted that there already is an all-white version of The Wizard of Oz; it's called The Wizard of Oz.. Almost didn't watch and I'm so glad I did! So fun, great cast, music, design; the whole thing really flew by. Found the breaks for commercial a little excessive; hopefully next year they can find a sponsor who will provide limited interruptions. After Peter Pan and The Sound Of Music, I went in to this kind of expecting to mostly-hate it. I was so, so pleasantly surprised. I can't wait to see what Shanice Williams does next, she was incredible. (Also major points to Ne-Yo. He might not be the world's best actor, but he's a hell of a dancer and he really nailed the small movements that made the Tin Man feel just right). It was definitely far, far superior to Peter Pan Live or The Sound of Music. I found it pleasantly enjoyable, though the camerawork was pretty terrible in a lot of places--several times it felt like either people were out of position and the camerapeople couldn't compensate, or they hadn't actually thought about how their blocking would show up on a tv screen. Common looked like he was reading off cue cards. Pretty much everyone looked like they were thinking verrrrrry hard about their choreography. It was good, but didn't feel relaxed, to me. In addition to fewer commercial breaks, I wish they had a live audience there. That said, the #MJB posts on Twitter that night cracked me up. though the camerawork was pretty terrible in a lot of places--several times it felt like either people were out of position and the camerapeople couldn't compensate, or they hadn't actually thought about how their blocking would show up on a tv screen. There was a moment sometime before the tornado where Dorothy was walking across stage and one of the cameras was visible, which was kind of adorable. I loved this. 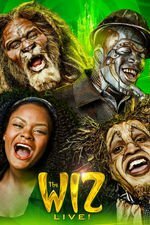 I've only ever seen the movie of The Wiz, back on cable in the 80's when I was a kid; I'm not sure I even watched the entire movie, I think I was so used to the Judy Garland movie it just felt completely alien to me. But this one totally worked on me. I didn't read anything about it until after it was over, so surprised to find out Shanice Williams is only 19. I'm so used to 20-30-year-olds playing teenagers. A tin man is a pretty good role for someone who is not a great actor. So stiff and unnatural! It's perfect! I haven't seen the actual stage musical, but this felt rushed...did they cut some material out to make room for commercials? Yeah! I would have preferred some more static cameras. Better than Peter Pan for sure. May have to watch again. did they cut some material out to make room for commercials? The AV Club review mentions that Harvey Fierstein was the script-doctor. They don't mention any cuts for time though. It did seem to end extremely abruptly - maybe the stage version ends the same way, but, at least there you'd get the curtain call. omg i loved the costumes! and can we talk for a single second about how great queen latifah's green contour makeup was? With that said, the costumes were great, the performances were great, and overall it was so entertaining that it even justified my sitting through all of Peter Pan Live last year. I'm not overly familiar with the stage script, having seen a production just once when I was a kid in the late 70s, but I can tell there was at least one cut. The song "Believe In Yourself" is originally sung by The Wiz, when he's explaining to the four that they don't really need his help. When Glinda sings it, it's a reprise. I was sort of sad they cut it, because The Wiz's version sort of has the more universally applicable lyric, since it lacks the instructions about clicking your heels three times. Anyway, the idea is they're going to mount this as a live show on Broadway next year. That should be awesome! One question I had - in the promo shots, Glinda has very big curly blonde hair. On the broadcast, it was up and plaited with jewels stuck in it. Has anyone explained why it changed? I couldn't get over the incredible physical command Elijah Kelley had in his performance. The dancing, the front-flips, the twists, the numerous times he was getting up and down from the floor like he had no joints . . . It was incredibly impressive. Why is he not getting all the parts? Why is he not in all the Broadway?! There were so many times though that I wish the camera would just zoom out. C'mon! I want to see the rest of the stage! I felt like this was the first one where they really showed how shooting for television could enhance the show over shooting through the proscenium. I made it through the first 45 minutes or so, but bailed after that. The performances weren't even that bad, but good lord when you're redoing songs sung by Lena Horne, Diana Ross and Michael Jackson, that is just never going to be a good idea. The only way it could have been a tougher task is if the original Lion had been Stevie Wonder and the Wiz was Al Green. It was also refreshing that they didn't feel the need to "urban-ize" it as the 1978 film version did by placing the story in New York City. I'm not sure why that would be disturbing to anybody and need refreshing. The Wiz™ is a treasure, and the city scenes in it were gorgeous and breathtaking. It was so unlike anything I'd encountered in black cinema then, and probably still is now. There are parts that are absolutely creepy, and it creates a bleakness in the production that occupies the heartwarming space The Wizard of Oz cultivated. It's like, at the core of the black experience in America there's this desolate feeling of despair. That we're just abandoned in lost cities with no way out. With cabs that turn off and run away when they see us. With elements of the city that watch us and are inscrutable. With projects and vacant buildings and a myriad of places in big cities like libraries that should be open to the public but are often closed on weekends or after 5pm, the structure of the city coming apart and pushing us away, the high-pitched squealing noises echoing as we're driven back to no place. It fits right in with the terror that exists in scenes in postapocalytpic films like Planet of the Apes, when Heston goes digging and finds the remnants of previous places and you see what once was. It fits right in with the "abandonporn" images of long unused amusement parks in Japan now retaken by plants and vines and trees. It fits right in with images of dead malls from around the country, with broken plaster footprints on static escalators and 80's style decoration on the walls of the remnants of the food court. It fits right in with the after-the-end scenes in 12 Monkeys and Ted Ross's lion has a moment that absolutely reminds of the phantom lion that roars at Bruce Willis. So that city scene didn't need updating to me, and I guess I'm glad I cut out when I did. Now I suppose I should just hope that Purlie doesn't get updated. This production was more in line with the original Broadway play. The movie was a total re-imagining produced by a bunch of White guys with a lot of extra re-jiggering in order to shoehorn Diana Ross into the part. Like, on the one hand I also found the sets haunting and beautiful. But on the other hand, it leaves a bad taste in my mouth that these White guys took a Black play about a girl being whisked off to a magical glorious fantasyland and the best fantasyland they could think of was still the ghetto. I think the setting spoke to that very particular point in history but it would be doing both the play and the performers a disservice to repeat the "schoolteacher lost in the ghetto" take rather than returning to the original book. I mean, no offense, but an NBC family night musical is not the place to channel "abandonporn". I would bet you anything that the majority of viewers--Black or White or whatever--would prefer the production as is to "images of dead malls from around the country, with broken plaster footprints on static escalators and 80's style decoration on the walls of the remnants of the food court". This one didn't have to do that, and I happily tuned out. I was just saying the one with Diana and Michael and Lena Horne wasn't some ball of crap. It actually represents some ideas and concepts you don't often experience in black cinema. It wasn't black pain in the way black pain gets portrayed 99% of the time through rap and films and television. The movie isn't all ghetto, though. Her Oz journey starts in an abandoned playground, and the Scarecrow is in a derelict empty lot, true. But the road leads to the decidedly upscale and glamorous Emerald City, with an extended dance number featuring a long list of the 70s' top fashion designers. I re-watched it for the first time in decades last week to remind myself of it, and what I really felt is that it's trying to be a big metaphor for the journey of black urban culture. The moment when the sweatshop Winkies unzip their grotesque rubber skins is really quite a powerful image of African-Americans breaking free of and rejecting the distorted images forced upon them. I'm just saying, I think the movie gets a bit unfairly maligned. It's not perfect, but I like what they were trying to do. I think sometimes it was just too much of a disconnect from what people expected that they couldn't quite see what it actually was. Or maybe it's just that when I first saw it I was just too young to understand what was supposed to be wrong with it. I mean, that Quincy Jones produced soundtrack album remains one of my favorites to this day. Though it's probably true that the movie feels a bit "heavy" from adult-ifying Dorothy and dwelling a bit too much in the melancholy parts of it. And I suppose some people feel the end scenes get a bit preachy. I liked the lighter tone of this live broadcast - it was more fun and upbeat to watch. It had a different kind of hip, urban feel even without using the explicitly urban visual imagery. It was produced by Rob Cohen, directed by Sidney Lumet, and the screenplay was by Joel Schumacher. If you go down the IMDB list everyone involved outside of the actors was White. If that's not "a bunch of white dudes" I don't know what is. Yeah, Diana Ross really, really, really wanted to play Dorothy, and rewrites to the script were made because she was never going to pass as a teenager. But a single Black artist's interest in playing a specific part does not count as having artistic control over the entire movie. It was a move driven by her ego, not by a desire to represent the Black experience. I just think it would have been interesting to see what the movie would've looked like with more influence from Black writers and filmmakers. As it is, like I said, I see its merits but it leaves a bad taste in my mouth. I would guess they were sensitive to the idea of putting the #1 Good Witch in a blonde wig.